Firstly - one last reminder for Aussie ladies to enter my Lust Have It subscription giveaway, it ends a midnight tonight. Tonight I have the last of my Picture Polish spam posts. This post completes my collection of Picture Polish shades, which can all be seen on my Picture Polish colour guide. Of course I know those ladies at Picture Polish are working busily on new shades, so I will continue to add to this as time goes by. 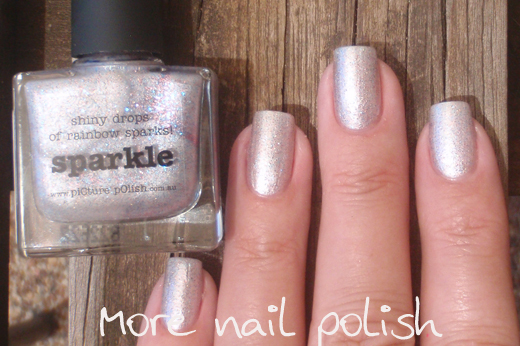 Sparkle - a light silver with a metallic pearl finish with tiny blue, yellow and pink square glitters. 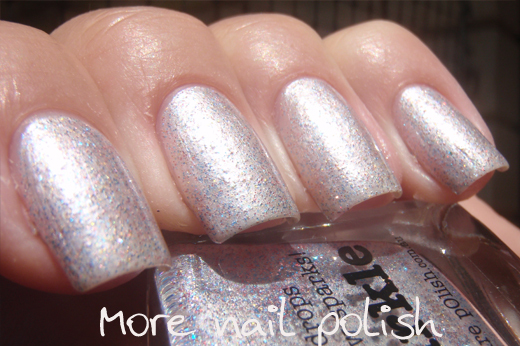 The glitters in the pearly shimmery base tend to make this look a little gritty, but the finish is completely smooth. This is now a limited edition shade. This is two coats with Ozotic Mr Big High Gloss top coat. Candy - classic barbie pink creme. Not too bright and not too pale either, just the right amount of brightness for a mid toned pink. This is two coats with Ozotic Mr Big High Gloss top coat. Peaches 'n cream - a pastel peach coloured creme polish which rounds out the ten light picture polish shades just perfectly. This is two coats with Ozotic Mr Big High Gloss top coat. 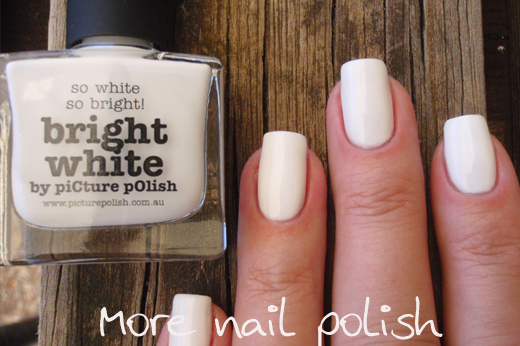 Bright White - is just that, a bright clean crisp white. This has become my go to white polish. I like the formula a little better than Ozotic Mr Big white polish because this seems to dry quicker. This is two coats with Ozotic Mr Big High Gloss top coat. 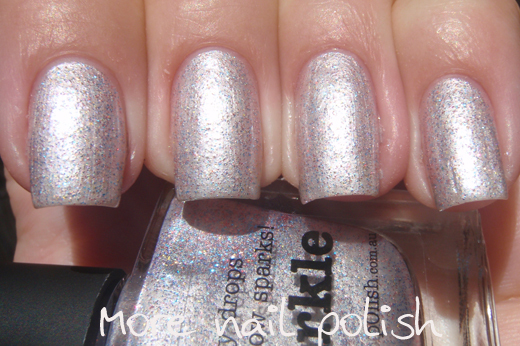 I love the look of all your picture polish swatches, gonna have to go out and buy myself some now!! I love Picture Polish! I have never tried any yet, but the colors are always super saturated and gorgeous. Is this an Indie polish or can I buy this at a brick and mortar store? I am going to have to get a bottle and try, and Mallard is the first one on my wish list, but Peaches and Cream is pretty too and very Springlike.